The interview began well enough until Trevor Noah asked Alexie why he decided to stop being a writer/author and do a book for kids. 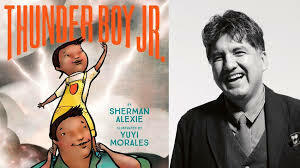 The question seemed sincere, and Alexie never missed a beat while he explained the reason why he wrote the book. But I seethed. Here it was again, the disdain for books for younger readers. I never become accustomed to this supercilious attitude. I have heard it from more than a few teachers over the years who question why we could possibly offer such dreck to readers in lieu of "the classics." I continue to hear it from others: this contemporary claptrap is not rigorous enough. Sure, offer YA to struggling readers, but those other kids need "real" literature. I hear parents brag that their darling children do not read books for kids. Their kids are too precocious and have moved on to "the classics" as well. No matter how many times I witness this snobbery, though, it never ceases to not only amaze me but dismay me as well. Anyone who believes that children's and middle grade and YA books cannot take on the mantle of literature does not read much. I have been thinking lately of making up a sort of care package for these clueless individuals, a set of books I could put into the mail so that they might be better educated. Imagine if we could persuade folks to read LAST STOP ON MAKRET STREET and RAYMIE NIGHTINGALE and I'LL GIVE YOU THE SUN to name just 3 books. What might it be like if those who decry the lack of rigor in a book might be invited to read THE ASTONISHING LIFE OF OCTAVIAN NOTHING and SAM AND DAVE DIG A HOLE and PAX? I once had a student write in her end of course reflection, "why would I ever bother with adult books when I can dive into the latest Joan Bauer?" I know when I see a comment like this that I have helped to support an educator who sees the value of books written FOR a younger audience (and most classics were never intended for that same younger audience), and an educator who will work to match kids to books whether in the classroom or in the library. If I can play a role in doing this then I am one happy teacher.